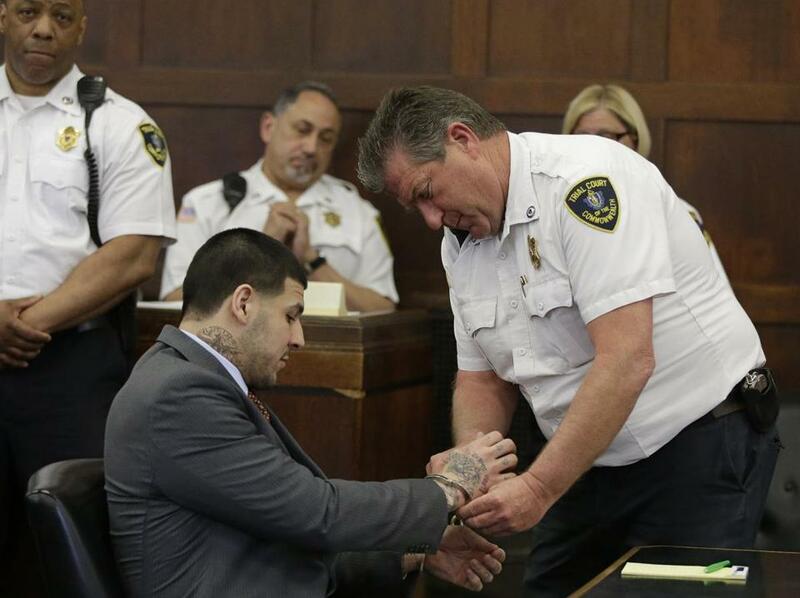 Aaron Hernandez hadhis handcuffs removed before his arraignment at Suffolk Superior Court on Thursday. In the months after Aaron Hernandez allegedly killed two men in Boston’s South End, the New England Patriots star became “increasingly paranoid and fearful” that police were investigating him, and he believed only one man could link him to the crime. That man was Alexander Bradley, who was with the now-former professional football player in Boston on July 16, 2012, when Hernandez allegedly fired five times at a BMW and killed Daniel de Abreu, 29, and Safiro Furtado, 28, a prosecutor said in court Thursday. Hernandez’s paranoia eventually turned violent, and, worried that Bradley might talk, he shot Bradley in the face during a trip to Florida to celebrate the 2013 Super Bowl, Suffolk First Assistant District Attorney Patrick Haggan said. Haggan spoke during Hernandez’s arraignment in Suffolk Superior Court on a charge of witness intimidation for allegedly shooting Bradley in Riviera Beach, Fla. Hernandez, who pleaded not guilty Thursday, is being prosecuted under a law that permits charges to be brought here even though the alleged crime occurred outside Massachusetts. Florida authorities did not charge Hernandez in the shooting, Haggan said. Bradley survived, but lost his right eye. He was shot a day after Hernandez saw two men in a Florida nightclub and became alarmed, Haggan said. The next night, the two men went to a nightclub in Miami, where they argued over the bill, Haggan said, and again later over a cellphone Bradley had left behind. Bradley fell asleep in the car, but woke up when the vehicle stopped in an alley. “He awoke to find a handgun pointed in his face — that handgun being held by the defendant,” Haggan said. Bradley has filed a civil lawsuit in Florida against Hernandez, seeking damages. He also testified against Hernandez during his recent trial for the murder of Odin Lloyd. Bradley is awaiting trial on an unrelated shooting in Connecticut. In the Boston killings in 2012, prosecutors allege Bradley was with Hernandez throughout the evening and was present at the Cure nightclub when de Abreu bumped into the football star and spilled some of his drink. Prosecutors have alleged that Hernandez felt disrespected, and later followed the men and shot at them while they were in a car. The hearing Thursday was the first time Hernandez has been seen in public since a jury found him guilty last month of murdering Lloyd in North Attleborough in June 2013, and he was sentenced to life in prison. Hernandez is awaiting trial in the Boston killings. 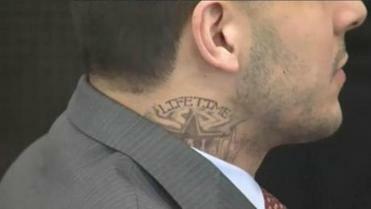 Wearing a gray suit, Hernandez appeared to have a new tattoo on his neck, including the word “Lifetime” above a star. Judge Jeffrey Locke set a hearing for June 4, when he is expected to take up a prosecution request to do DNA testing on a .38-caliber revolver allegedly used in the Boston killings. A trial date is also expected to be scheduled.